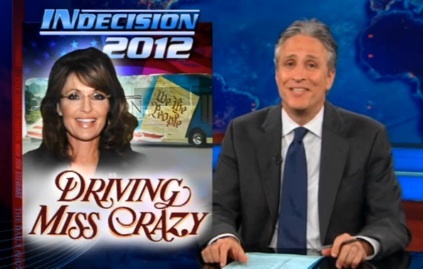 Jon Stewart: Sarah Palin Won’t Talk To Media Because…Roger Ailes Won’t Allow It? Coming back from a week long vacation from the news last night, Jon Stewart laced into both the mysterious One Nation bus tour of Sarah Palin — and the media that are desperately trying to cover/make sense of it. Stewart cited a blog post by the one lucky journalist allowed to interview Palin on her bus, Fox News’ Greta Van Susteren, who in a blog post explained that she got the plum interview spot since Palin is a fellow Fox News employee. In Stewart’s estimation, ergo, Fox News’ chief Roger Ailes is calling the shots.